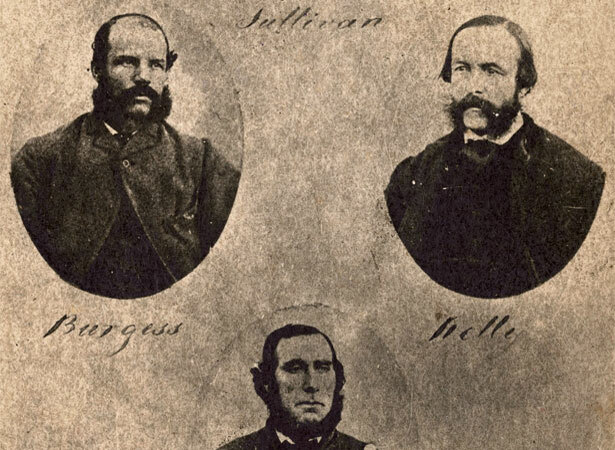 The murder of five men on the Maungatapu track, south-east of Nelson, in June 1866 shocked the colony. These killings by the so-called ‘Burgess gang’, resembled something from the American Wild West. Richard Burgess, Thomas Kelly, Philip Levy and Joseph Sullivan had come to New Zealand via the goldfields of Victoria, Australia. Three of them had been transported to Australia for crimes committed in England. They were just the sort of ‘career criminals’ that authorities had feared would arrive following the discovery of gold in the South Island in the 1860s. After killing a prospector on 12 June, the gang ambushed and murdered a party of four on their way to the West Coast the following day. They were arrested in Nelson within a week, having aroused suspicion by spending money freely. The public followed their trial with great interest, eagerly snapping up sketches and accounts of the case. It became more intriguing when Sullivan turned on his co-accused and provided the evidence that convicted them. He escaped the gallows; the other three men were not so lucky. We have 3 biographies, 5 articles, related to Murder on the Maungatapu track.